Andrew Sutton, who married Sallie Ross, came from Dooly county. Their children were: Seaborn, John R., Joe, Jack, Martha, Cornelia, Betsy, Susie, Kate and Celia. Seaborn married Catherine Oliver. Their children were: Sallie, who married George L. Paulk; she died. Reason married Susie Lawrence; daughter of Rev. R.A. Lawrence; Jimmie married Jake Young, son of Hon. George Young. John H., son of Andrew Sutton, married Flora Hooks. She died leaving Alice who married A.J. Hutchinson; and Jane single. John R. married Miss Bowen the second time. Joe, son of Andrew, married Missouri Sumner, daughter of old Joe. 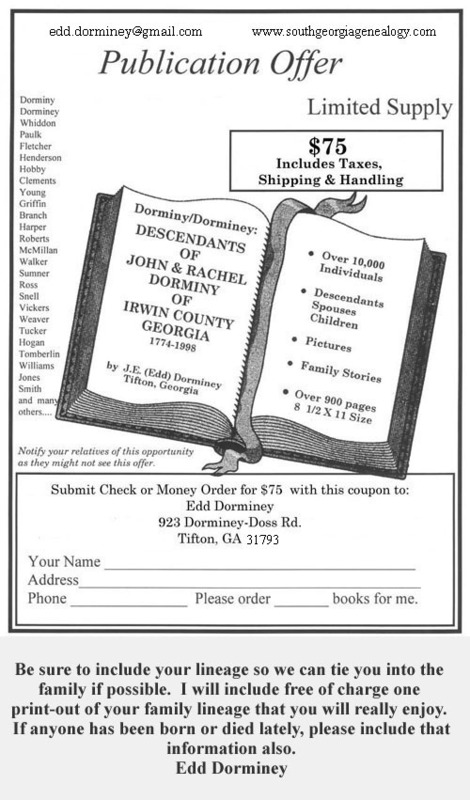 Their children were Henry, who was Tax Receiver of Tift County for four year, 1909-13. He married Sarah Fletcher, daughter of Elbert. Susanna, daughter of Joe, married Boy Fletcher, son of Black Jim. Martha, daughter of Andrew Sutton, married Ashley Sumner, son of old William. Cornelia, daughter of Andrew Sutton, married John Sumner, son of Jesse. Celia married Jim King; she died. Kate married Jesse Sumner, son of old Jesse. Jack, son of Andrew, married Maria Robertson. Their children were: Jack, who married Miss Owens; Dan, who married Cab Smith: Their children were: Tullie and Luther. Tullie married Martha Whiddon. He was killed by William Sumner. Luther married Carrie Cromer. Alice married Tom Barfield.